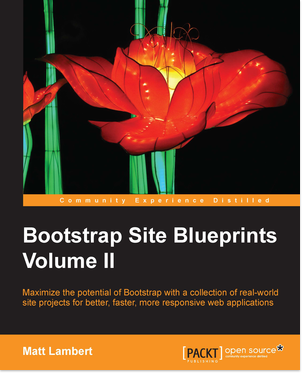 I’m happy to announce my newest book Bootstrap Site Blueprints 2 is now available for order! The book is a collection of real world web applications and how to build them with Bootstrap. Each project includes the full sample code to make the learning experience straightforward. There are two options for buying the book. The first is the eBook only which costs $39.99. The second is a hardcopy of the book + the eBook for $49.99. Yes! Both versions of the book come with all the source files for each product that you’ll build. There are 7 projects in total. Packt Publishing offers full refunds for print books purchased from their website. More details about their return policies can be viewed here. Unfortunately, they are not able to offer returns on eBooks. Is there a discount code available? Yes! For a limited time you can save 50% off the price of the eBook with code vqk0US1. When you purchase the eBook from the Packt Publishing website, you’ll receive it in the following formats: PDF, ePubs and Mobi. Can I buy the book anywhere else? Yes, the book is available from a number of online retailers that are listed below. However, the eBook discount is only available through the Packt Publishing web store. If you purchase from another web store, please review their return policies before purchasing. That’s it, that’s all. If you have any questions about the book please leave a comment or hit me up on Twitter.